Intricacies of the plot shall be mulled over in this review, so please don't get sad if you continue reading and ruin the whole thing for yourself. You have been warned! With his wife's disappearance having become the focus of an intense media circus, a man sees the spotlight turned on him when it's suspected that he may not be innocent. In a non linear hash of flashbacks and diary entries we are introduced to the most toxic of all couples. From their blissful beginnings and engagement, all the way up to the day of their fifth wedding anniversary where things start to get a bit strained to say the least. “What are you thinking? How are you feeling? What have we done to each other?” As Nick Dunne's voice addresses the beautifully blonde tresses rested upon his chest we are introduced to the deadpan eyes of 'Amazing Amy'. And from the outset this film strikes an unrelenting chord of unease that does not diminish one iota until the credits roll. Even then, the themes and imagery linger in the mind for days to come. Gone Girl is a searing study of long term relationships, gender roles and the modern media furore that is prevalent in today's society. What's so beautiful about Fincher's latest directorial effort is the transition between the three acts. 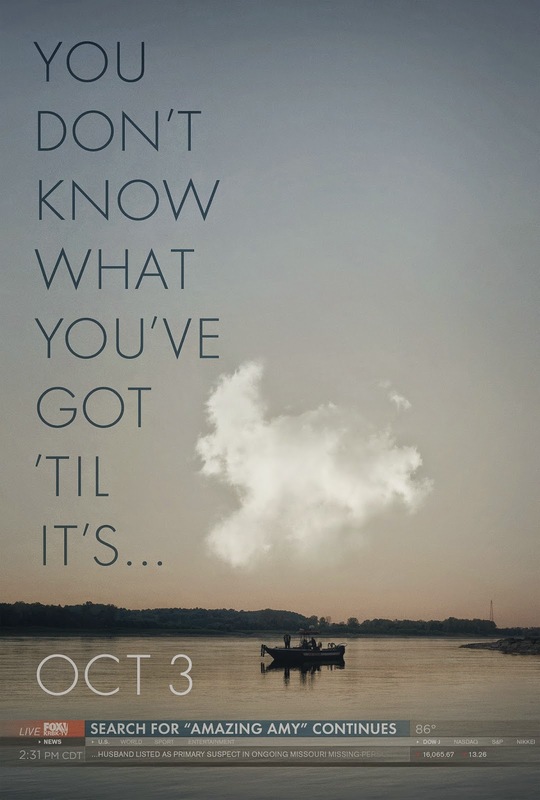 The opening of the movie follows a archetypal mystery, then at the halfway point Gone Girl becomes a perverse thriller and then it all ends on a note of satire. To a certain extent the third act does power down quite significantly. Once crisp and clinical pace becomes foggy confusion, like a train slowing as it pulls into the station. But just like Se7en and Fight Club, this masterpiece ends with a arresting final scene. Not striking in an Inception moment of revelation way, but in a subtly shocking and thoughtful way that is just as mind blowing. You can literally feel the reception of it reverberate throughout the very souls of the viewers. In terms of production there is so much right with this film. After the success of The Social Network score, Fincher understandably came knocking once again on the doors of Trent Reznor and Atticus Ross. The soundtrack is a perfect accompaniment to this story. I read that they wanted it to sound like the relaxing music of a massage parlour that is so tranquil it actually become uneasy and anxiety inducing. Edge of your seat stuff. There is bound to be Oscar buzz surrounding Gone Girl but right now I'm calling Cinematography and Best Actress. Cinematography because the entire movie is stunningly immersive and creates a bleak yet handsome view of the Midwest. An icy aesthetic, much like The Girl With The Dragon Tattoo. The house is cold and clinical, the loneliness pours from the screen. Best Actress because this is the best I have ever seen Rosamund Pike, her performance truly floored me. Flynn's characters have been portrayed as these venomously deceitful yet transfixing creatures who make you feel and reflect upon their every word and action. The poise with which she executes her Amy is utterly iconic and captivating. She's like a python. A chillingly vacant, dangerous and yet oddly beautiful snake. Fincher has weaved a rich tapestry of plot twists, unreliable narrators and I can't help but feel there is a spectre of misogyny seeping into this collection of threads. Undoubtedly Amy is deranged and that is everyone's first thought; not that Nick may have driven her to it. Provocation can never be a justification nor an excuse for Amy's depraved acts. But, if she's a crazed psycho, he's an adulterer and a domestic abuser. He even articulates that he's not even sure if he wants his wife to come home so she can resume her position as trophy wife gathering dust at home. Rightly or wrongly, Fincher (and subsequently the audience) seem somewhat more partial to Nick's side of the coin as opposed to Amy's. Her fragile mindset caused by years of failing to live up to the illustrious life of 'Amazing Amy', her failed marriage, her loss of profession and the fact that the man she loved is entirely indifferent to her presence are bound to make anyone slightly crazy. Similarly, none of the women depicted (with the exception of Margo) seem 'ideal' for Nick. Amy faked a pregnancy in order to incarcerate him in marriage further by carrying his unborn child, she also lied about being abused. The female news reporters were the ring leaders of a witch hunt with the intention of turning the entirety of America against him and landing him on death row. Boney seemed equally certain of Nick's guilt despite not even having a body. And Andie stabbed him in the back by going public with the facts he had been having an affair with her thus screwing up his media persona to an even greater degree. But he himself is the root of all of this. He was the trigger that started the chain of events. With that said, it is refreshing to see a character like Amy Dunne. This movie also does not sing many praises for relationships in general. If the courting stage is all an act of pretence, with the woman conjuring up a representation of the Cool Girl and the man feigning a Charming Guy. And then during marriage men apparently turn into performing monkeys intending to please their patrolling nagging wives - can you ever truly be yourself in a relationship? Or does this deceptive crafting chip away at the individuals until all that's left is resentment because the smokescreen clears and facade cannot be kept up anymore. 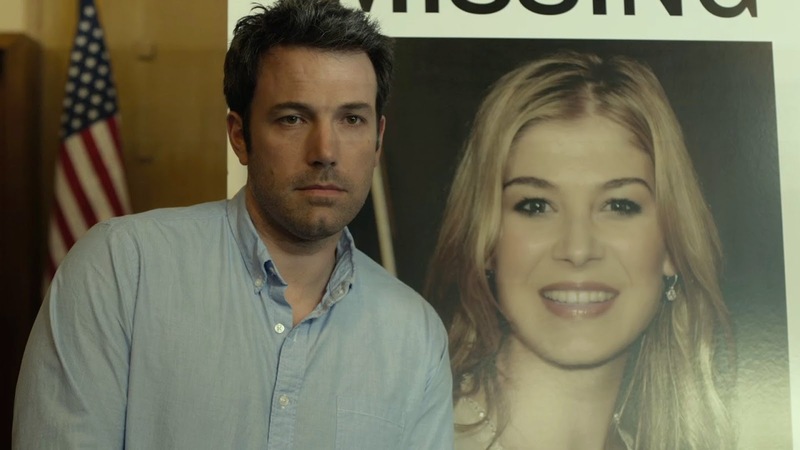 Gone Girl depicts the emotional demise of two souls individually, yet still the 'relationship' survives as this horribly twisted, contorted and dysfunctional ruin. It's daring, smart and deeply unsettling. A must-see.